"Faces From an American Dream: Photographs by Martin J. Desht, Sculptur"
Faces From an American Dream: Photographs by Martin J. Desht, Sculptures by Ccopacatty, January 17 - March 9, 2001, Reception: Friday, February 9, 2001 5-8 p.m.
"Faces from an American Dream" is a traveling photographic exhibit that examines American de-industrialization, the term used to describe an economy losing its industrial base to a more service-oriented nature. 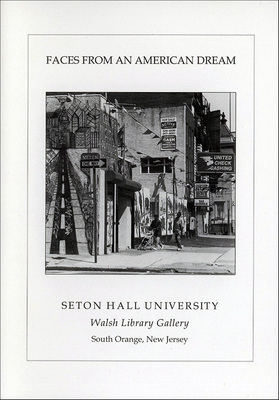 The exhibit reflects the changes de-industrialization has brought for both skilled and unskilled American workers, and its effects on poverty, immigration and new urban enterprises. Co-sponsored by the Department of Community Development, the Human Relations Committee, the Office of Alumni Relations, the Multicultural Program, and the Friends of Walsh Library Gallery.